When we moved into our house ten years ago, I was on a decorating spree. 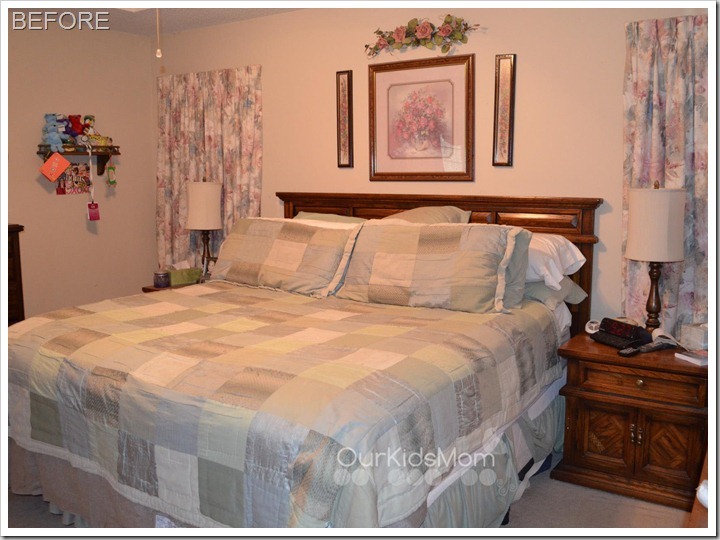 I made sure everyone in the house had a place of their own that they loved… but neglected our bedroom. I had thrown up the curtains and wall décor from the old house and when our bed spread wore out I purchased the cheapest one in green I could get. 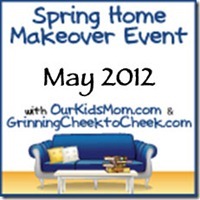 When Amy and I started planning our Spring Home Makeover, I instantly thought of the kids rooms. I am the type of person that always puts my family first. 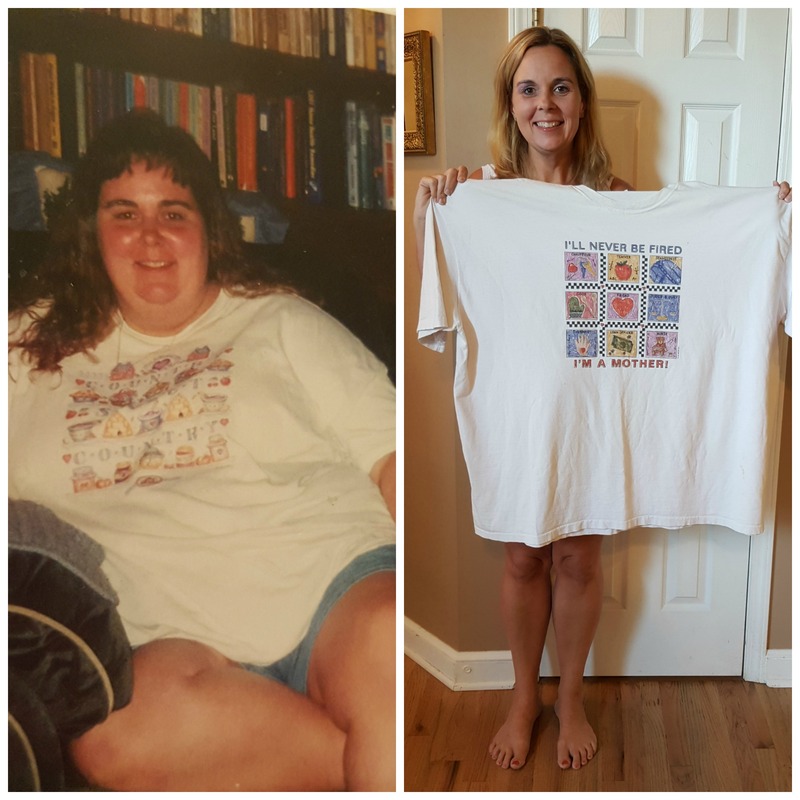 It finally sunk in that maybe it was time for me to think of myself (and my husband)… so I contacted Sleepys in hopes that they could help turn this bedroom into a new nest for us for our 24th wedding anniversary. Sleepys was more than gracious in their response. Not only were they going to help with the comforter set, but they wanted to start at the top and work down. The first item they mentioned was their Serenity gel pillow set. Sleep well with the comfy Serenity Gel Pillow 2 Pack. 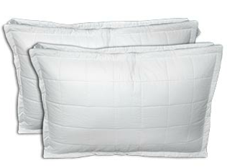 These hypoallergenic pillows offers excellent support for stomach, back, and side sleepers. The Serenity Gel Pillow 2 Pack is filled with hypoallergenic micro gel polyester fibers for a soft and luxurious down-like sensation. Quilted and gusseted for additional loft and support, this pillow is suitable for all sleeping positions. As you can see, these pillows are nice and thick. The cover fabric is 100% combed cotton sateen in 300 thread count with a 4” gusset and satin piping all around. We have been using these pillows for a few months now and I am happy to say they are still on our bed in a prominent position. These pillows form well to your head while still giving the support your neck needs. They also “goosh” well. I like to take the end of my pillow and fold it under to support the end more when I am laying on my side. The ends still have the same loft they did when they arrived even when I “goosh” it every night. The next item Sleepys sent is also meant to help us have a better nights sleep. 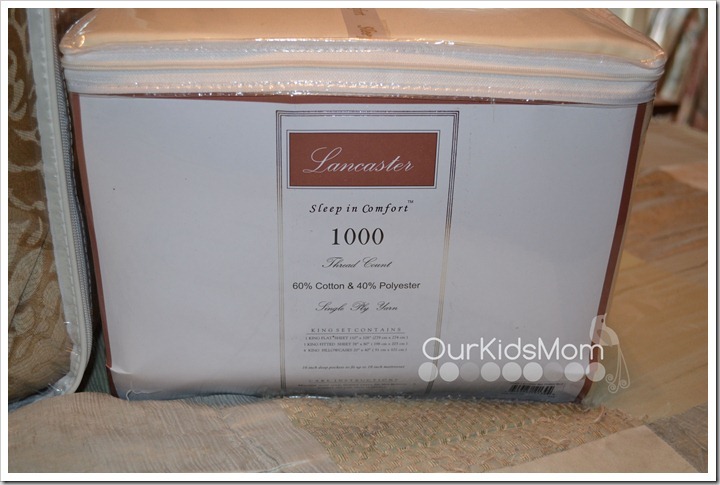 We were sent a set of 1000 thread count sheets made by Lancaster. To be honest, I have never slept on any thread count higher than 300. I really did not realize there was such a huge difference in sheets. When I pulled the sheets out to wash them and put them on the bed I could not believe how thick they were compared to my old set. They made the old ones feel like paper in comparison. Because of the quality I was worried that there might be special washing instructions. I was happy to see that they were machine wash cold/gentle cycle and tumble dry low. The sheets washed up well and were just as soft when they came out of the drier. I have always had issues with the pockets on sheets sets popping off the corners when we slept. Making the bed I noticed that these pockets had more than enough room and after a month of using them I am happy to say they stayed on the mattress fabulously. Slipping into bed that night I instantly realized why higher thread count sheets were a luxury. They were super soft and I instantly relaxed. No more scratchy feeling or that bally pilling that happens on the cheap sheets. I’ve washed these several times and they are the same now as the day I opened the package. 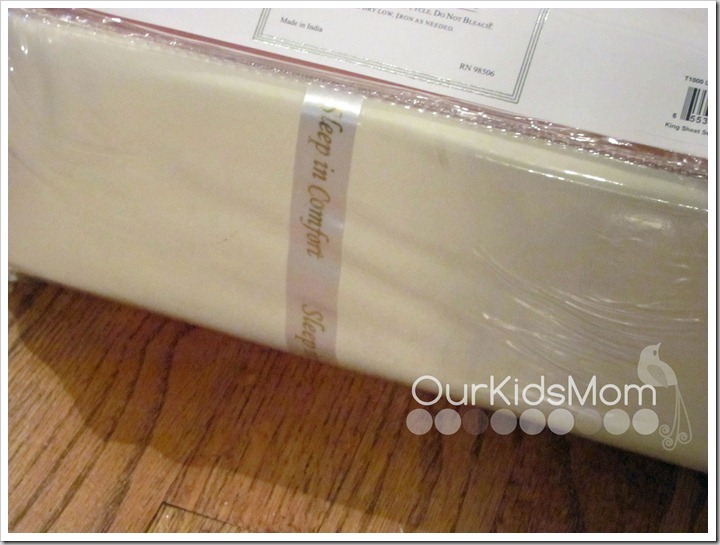 The last item Sleepys sent to make over our bedroom was the Prescott Comforter Super Pack. This was the item I was most excited about because it was the most noticeable item in the makeover. I had all my fingers crossed that the photo was accurate on the website because the description mentioned sparkling gold which made me start to wonder if maybe it was the slick satin type of material that I was trying to avoid because of my cats (not declawed and they would have ruined it). Enjoy the comfort and durability of the Prescott Comforter Super Pack. This comforter set in gold with flowers is perfect for any bedroom in your home. This sparkling gold comforter features large chrysanthemum flowers in bronze and light beige colors. Extra thick cording and quality double stitching enhance durability. I was over the moon excited when I pulled the pieces from the bag. This style was the complete opposite of anything I have ever picked for our bedroom. I am usually the pink/purple ultra girly floral with lace kind of girl. This time around I decided to try to pick a more rich and inviting color that was neither feminine nor masculine. I think the Prescott was a nice mix of the two! It was hard to photograph the set because my room tends to be dark, but you can see in the photo above the flash picked up the gold tones nicely. The mix of the earth tones and gold as the accent gives the room a rich and warm feeling that I am thrilled with. The king set comes with everything you need to achieve the look above. It includes 11 pieces: comforter, bed skirt, 2 standard shams, tri pillow pack, 3 Euro covers and 3 sham covers. I filled the smaller shams with pillows, but the larger three were perfectly square and needed a different fill. I decided to go the least expensive route and I purchased a box of poly fill. Stuffing them was easy and I tacked the back in 3 spots to keep the fill in. Call me cheap, but it worked and looks nice! I have never owned a bedding set this nice before and I am beyond thrilled with the look, feel and quality of the fabric and the loft in the comforter. Although making the bed with a huge pile of pillows has taken a little getting used to, I love the look and the welcoming feel they bring to my bedroom. My bedroom makeover was a huge success thanks to Sleepys, the mattress professionals. Yes! They carry much more than mattresses and all of the items sent for our makeover were exceptional quality. If you are in the market for bedding, I would recommend stopping by their site before purchasing. They carry just about everything you need to make over your bedroom… you might be surprised by what you find! Use coupon BLOG10 to save 10% off all bedding products at Sleepys and to sweeten the deal free shipping (with no minimum purchase) is always available on their bedding accessories. Products are shipped through UPS and are delivered right your front door. Valid through July 9, 2012. 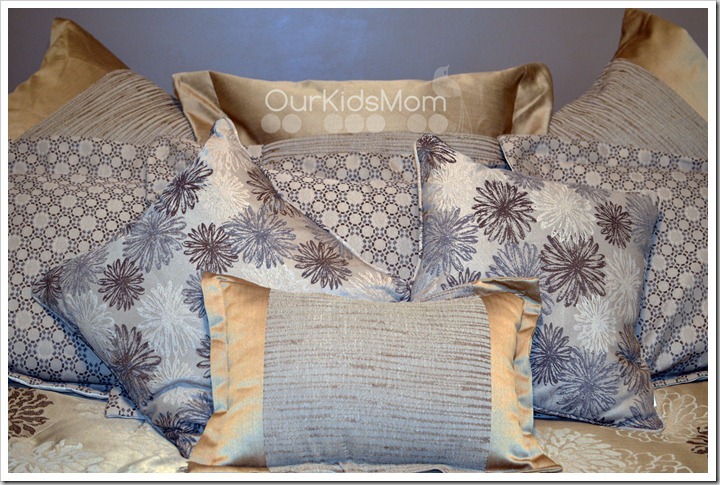 ONE OurKidsMom reader is going to win a 2 pack of Serenity Pillows! This giveaway ended at 11:59 PM EST on June 22, 2012. I like the Jessica 4 Piece Comforter Set from Sleepys! I like the Pirates Treasure Quilt Set. I like the Stomach Sleeper Position Pillow. i like the pirates quilt. I like their ladybug slippers! I like their sleep guide. It makes choosing a mattress easier! Oh how I’d love the Outlast Sheet Set in queen. I LOVE THE BLISS MICROFIBER SHEETS AND THE 1000 THREAD COUNT SHEETS. I want the Stomach Sleeper Position Pillow!! I love the panda blankets! I love the faux fur throw. I like the memory foam mattress toppers. I like the Classic Tranquility Memory Foam Pillow. I would definitely want to try the Serenity Gel Pillow; I am also a pillow folder. I want to try the 1000 tc sheets too, I don’t think I’ve owned a set w/ more than 200 tc. eek! Sleepys has been in business for 54 years and has over 700 stores. I’d love to have the pillow set…. and the bedding sets are awesome. I like the rich colors of the Gillian bedding set! I would like to try the The TEMPUR-Simplicity Medium. Sorry…I didn’t think the first one went thru! I like the Steamer Trunk Cocktail table at Sleepy’s. I would love to own this Sealy Posturepedic Annot Plush Mattress. That would be a dream come true. I love the Belize comforter set. I’d like to have the Serenity Gel Pillow! I like the pink day bed set! I love all of this. ! I like the Sonata 8 Piece Reversible Bed-in-a-Bag. The girls Olivia Quilt Set is very nice. I love the faux fur throw!! The Eclipse firm crib mattress would be great! I love the cooling gel mat!! I would love the The AlluraBed by Tempur-Pedic. I like the panda blanket. They have free delivery on certain items. I learned you can get a free cooling pillow pad with the purchase of any pillow. I like the Back Sleeper Position Pillow. It would be great for me. i like that they have a variety of useful pillows for back, side, stomach sleepers and even an anti-snore pillow! I would like to try their 3 inch 7 zone memory foam mattress topper. I love the Colorful Sea Quilt set for kids. I liked so many things. I really like the Sea Breeze Cotton Blankets because they come in some really bright colors. I also liked the Back Sleeper Position Pillow. I have to sleep on my back at an angle so I’m going to check this out. Thanks for the chance to win and the giveaway! I want the The Astoria Daybed! I would like the Organic Duvet Cover! Thank you. My grandson would like the All State Quilt Set! I learned that Sleepy’s deliver over 3,000 mattresses every day. Love the W Hotel Mattresses! I learned that you can still buy a folding cot. Who knew! I LOVE the Pirates Treasure Quilt Set! Thanks for the chance to win! I’d love to have the Trafalgar 7-Piece Comforter Set! I would love to have the Cooling Gelmat. I would love to have the AlluraBed by Tempur-Pedic. 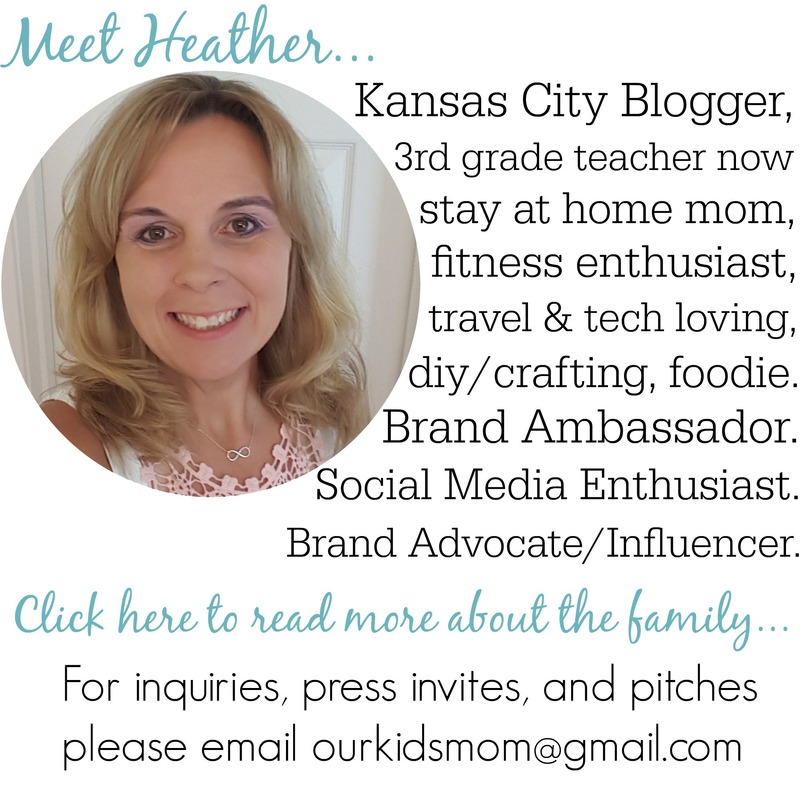 Thanks Heather!!! I learned that they sell everything you need for a bedroom. from Mattresses to furniture! Like the Annie comforter set. Would love to get the Sertapedic University Park Pillow Top Mattress . i also like the Simmons Maxipedic Barrow Firm Mattress in Queen size! My son would go nuts over those Hot dog Pillows!!!!! They are too cute! I like the Plaid Garden Quilt Set. I had no idea they had so many products other than just mattresses and pillow! Love a lot of their daybeds and bed in a bags and a couple of cute chairs and lamps even! I like the Newport Two Drawer Nightstand. Thanks. I love the churchill 7 piece comforter set. The Newport Bed immediately caught my eye – nice clean lines and affordable to boot. Sounds like my kind of furniture! I like the The TEMPUR – Cloud Supreme! I want the gel pillow set! I would love to have the Bay Recliner. I like the Sealy Supreme Sleep Rivulet Plush Mattress! I love the Genesis comforter set!! I learned that they carry a lot more items than I ever thought they did! I’d also like the FiberFlip Pillow! I would love a new foam mattress, mine is over 15 years old! They have some nice ones! I love that they offer mattresses and the bedding to go with it. Most mattress places don’t do that. The Brighton Two Drawer Nightstand looks very nice! The cooling gelmat for the bed looks awesome! I would love the “Butterfly Kisses Quilt Set Product Code PMKISQ” for my daughter’s bedroom. This set would match perfectly with her NEW bedroom set. Love the prices on the closeout mattresses! Wow! Thanks! Eww would love to win this! Mama never gets new stuff! Oh, would I just love to have a G.S. Stearns Cushion Firm Euro Pillowtop Mattress! I love the stomach sleeper pillow. I love the Outlast blanket! i would love to try their Tempur-Pedic Cloud Supreme!! omg i bet if would feel amazing and i would finally get a goods night sleep! i have really bad back problems and i bet it would be like heaven! I would love to have Eclipse 2 inch Gel Plus Memory Foam Reversible Topper So I can be cool in the summer and warm in the winter. I like the Spring Vista Indoor Outdoor Rug. I would love to have a firm Tempur Pedic mattress. A girl can dream. I like the Tempur-Pedic mattresses. I found lots to love at Sleepy’s website / online store. Among my favorites (must haves?) are the Contour Anti-Snore Pillow and the Cooling Pillow Pad! I like the The ComfortTech Albany Blanket Product Code EYALBA. I like the Aden comforter pack. I like the Reversible Paisley Duvet. I would love to have a temurpedic mattress! LOL! The 5 piece zebra daybed set I would love to have for my daughters room. We have very slowly been trying to decorate her room with zebra decor, but because of the expense, and having 3 boys at home in addition to my daughter…the expenses of so many other things have prevented us from getting her a zebra bedspread. I would loooveee the body pillow!!! I’ve been thinking about buying a couple of these pillows…..maybe this is a sign! I really want the BedLiner with OmniGuard Ultra. I want something that keeps liquids and skin cells out of the bed. We’ve had too many bottle leaks on our mattress! I like the The Winslow Bed. I think iron would look great with dark wood and neutral colors. I really liked the upholstered headboards, but they were not available in the color I was looking for and I worry about white fabric and little boys running wild… But I think the iron would hold up well. I love the Jessica 4 Piece Comforter Set. And it’s at a great price too. I would love the New Sound Asleep Pillow with Speaker for my husband. He is always falling asleep with his headphones on. I really love the Barcelona 8 Piece Reversible Bed-in-a-Bag. It’s so pretty! I love the Chateau Sleigh Bed. Oh man! I would LOVE a new latex foam mattress… I long for super soft cush. I like that they have different pillows for different sleeping positions. Sleepy’s has such a variety of products for the bedroom . I liked a few of the Head and foot frames. I like their Temperpedic mattresses! I want the The AlluraBed by Tempur-Pedic (Product Code TPALLU). I like the faux fur throw. 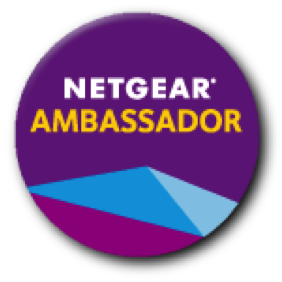 they have a great site. I like the Bay Recliner! I didn’t realize they sold bedroom furniture too! I learned they offer the largest selection in the world of their product types. Good to know. I love the 3 inch memory foam topper! the Back Sleeper Position Pillow looks interesting. Temper Pericles body pillow, they look amazing! The Ballet Lessons Quilt Set looks great! I love the Tempur-Pedic Ergo Adjustable Base with TEMPUR – Cloud Supreme Mattress! I’d love to have the Tempur-Pedic Cloud Supreme mattress. 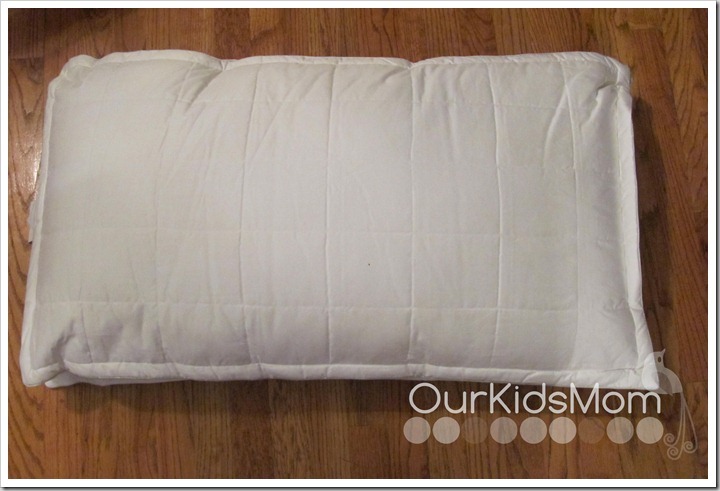 I would love the Memory Foam Kids Pillow for my son’s bed. I’d love to try the stomach sleeper position pillow- I’ve never had a pillow specifically for sleeping on my stomach! Company is having LOTS of sales! i liked the bay recliner. I like and want to try the Back Sleeper Position Pillow. They have cool action gel memory foam. They have a Cooling Gelmat that would be really nice. I really like the Genesis 8 Piece Reversible Bed-in-a-Bag product from the site. I want to try the Cool Action Gel Memory Foam mattress. Hmmm…I wonder if that works. I like the Faux Fur Throw! I could really use a Tempurpedic Mattress set. I have Fibromyalgia and my current mattress is 20 years old. I like the King Koil Comfort Solutions Caraballo Firm Mattress. I would like to have the Outlast Blanket. I like the W Hotels Pillow Top Mattress. Thanks!! I love the faux fur throw! I would love to have a tempur-pedic mattress. I want their serenity pillows~! I found out that a lot of their mattresses are one sale. They range from extra firm to ultra plush. So, they should have a comfortable mattress for everybody. I like the Quadratic 2pc Wall Sculpture! I really like the Colorful Sea Quilt Set. I love the Jessica 4 piece comforter set! It’s the colors of our bedroom! I want the Riva Platform Bed. I’d like to have the Cooling Gelmat since being too hot is one of my biggest problems when trying to fall asleep. Love the Stearns & Foster Estate Michaela Luxury Plush Eurotop mattress!